Today’s card was based on this week’s Mojo Monday Sketch Mojo195. The base is new In Color Calypso Coral (available July 1st). I layered it with Chocolate Chip card stock and one of the patterns in the new Flirtatious Specialty Designer Series Paper. Across the front, I used three pieces of Chocolate Chip Scallop Dot Ribbon. In the center, the doily is from the Flirtatious Specialty DSP as well. There are two die cut sheets of doilies in the package of DSP. The colors are Pumpkin Pie and Melon Mambo. To coordinate with the colors of my card, I used one of the Pumpkin Pie doilies, but I turned it over and brayered the back with Calypso Coral ink (the backs are white). 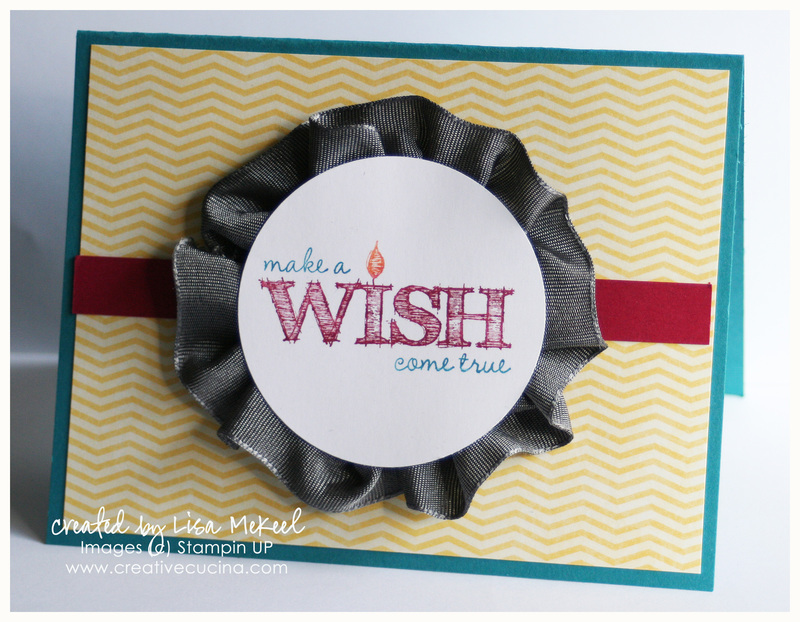 Behind that, I layered a chocolate chip circle punched with the 2 1/2″ Circle Punch. 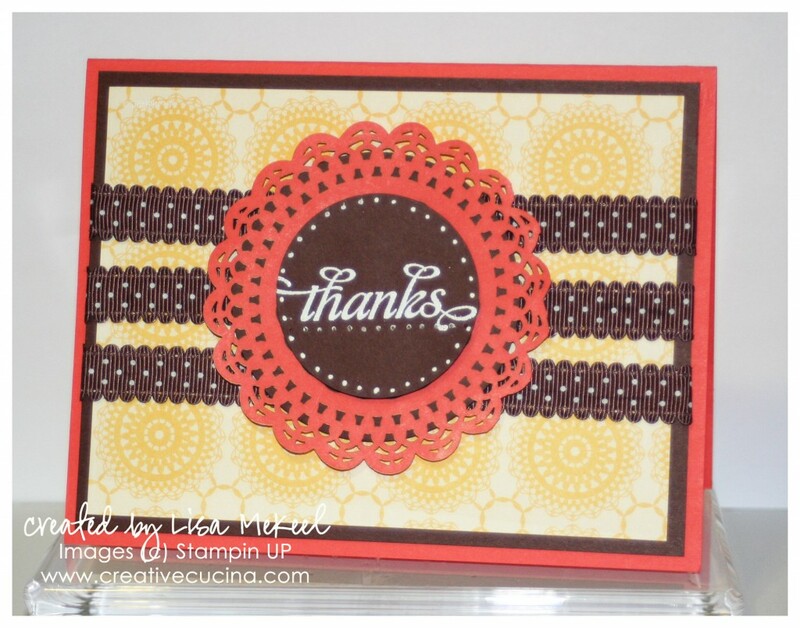 On top, I stamped “thanks” from Thank You Kindly with Versamark and heat embossed with White Embossing Powder. The stamped circle is made with the 1 3/4″ Circle Punch. I outlined the circle with dots using the White Gel Pen. I made this card for my husband’s grandmother. He suggested mailing her a card but I told him that was impossible because this one was BIG and bulky! 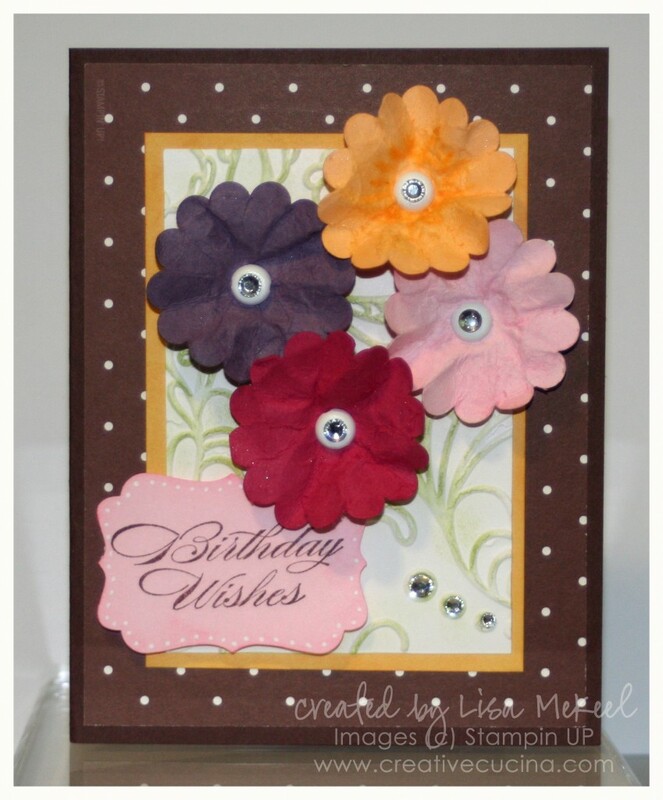 The card base is chocolate chip, layered with Chocolate Chip DSP in this polka dot pattern. As for the flowers, I made them by punching different colored card stock with the Scallop Circle Punch. Then, I sprayed the scallop circles with water, crumpled them up, and let them dry. I added a white Basic Brad in the center of each flower, topped with a Rhinestone Jewel. In the background, I used Apricot Appeal card stock, layered with Whisper White that I ran through the Big Shot with the Elegant Lines Embossing Folder. Using the sponge dauber, I added Certainly Celery ink to the raised portions. The sentiment is from Bring on the Cake. 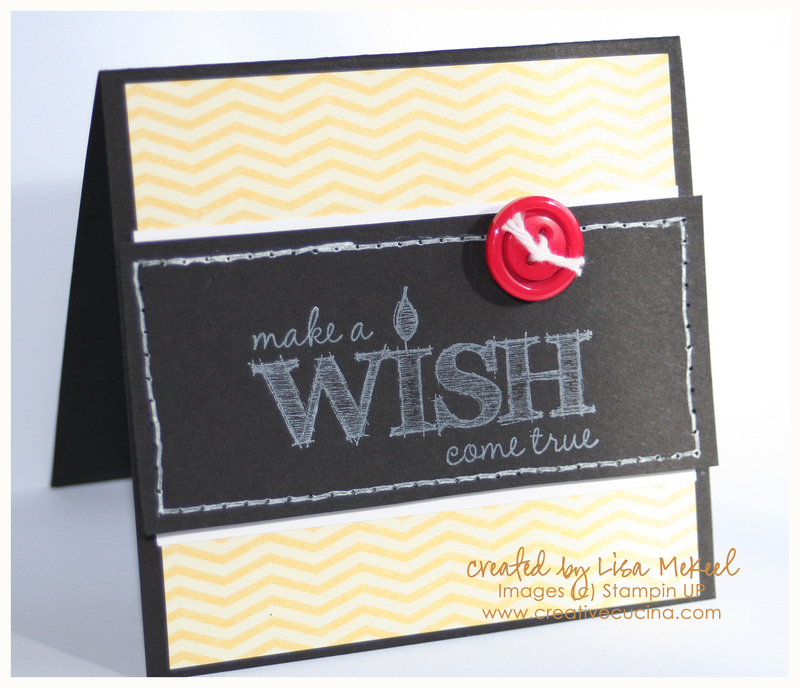 I stamped it in Chocolate Chip ink on Pretty in Pink card stock, then punched it out with the Decorative Label Punch. To give it more interest, I sponged the edges with Pretty in Pink ink and added white dots with the White Gel Pen.